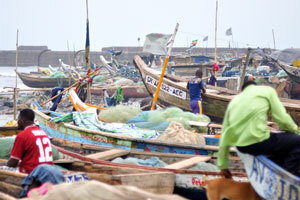 There is a harbour in Jamestown with an expanse of Atlantic, dotted with traditional fishing boats called pirogues. 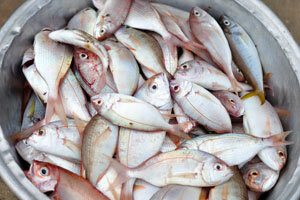 When the catch comes in there is amazing fresh fish everywhere: squid, barracuda, mackerel, flounder, and bass among them. 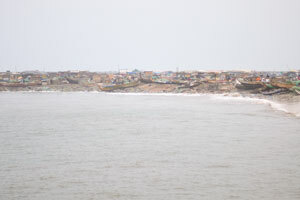 You'll see people barter and buy those fish and take them straight to smokers - there's one at the side of virtually every house - and from there they'll sell them. 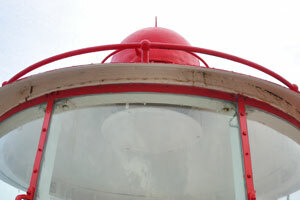 If you've got good legs, walk up to the top of the lighthouse on Cleland Road for its views. 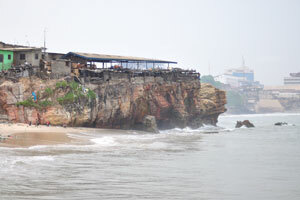 It overlooks the harbour and you can see the James fort, the Bukom district and the Ussher fort. 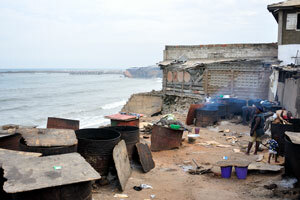 This kitchen at the open air is located on the shore of the Gulf of Guinea. 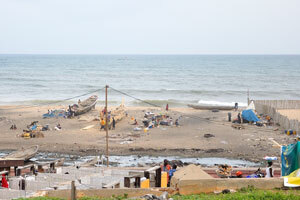 This is the shore of the Gulf of Guinea in Jamestown. 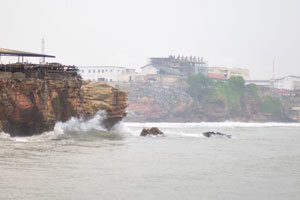 Waves of the Gulf of Guinea. 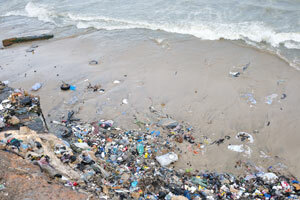 The shore of the Gulf of Guinea is full of the garbage near Jamestown. 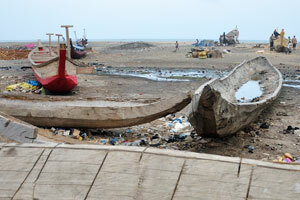 The strange construction is found on the shore of the Gulf of Guinea. 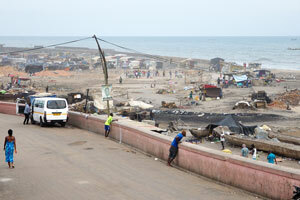 A dull day is on the shore of the Gulf of Guinea. 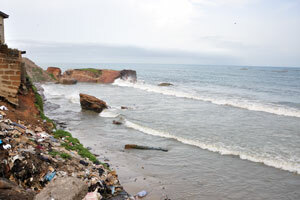 The coast of the Gulf of Guinea in the area of lighthouse. 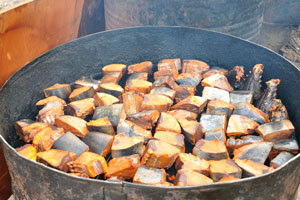 The process of fish smoking takes place inside the huge bowl. 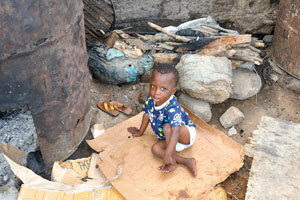 A little african boy is sitting between rusty metal barrels used for fish smoking. 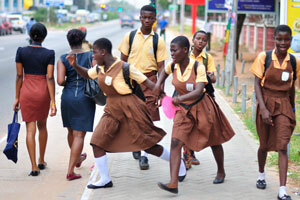 A group of schoolgirls are somewhere on John Evans Atta Mills High St.
A group of schoolgirls are smiling with the lovely grimaces on their faces. 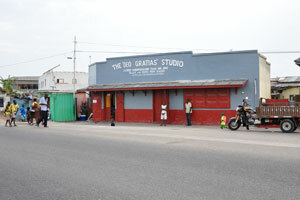 High Street Computer & Business Institute. 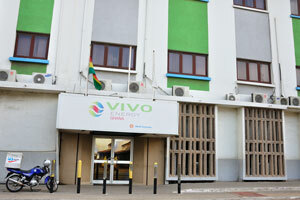 Vivo Energy Ghana gas company. 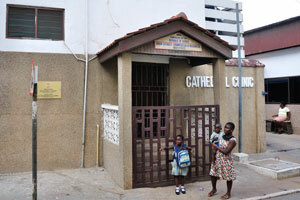 A group of schoolgirls crosses the road close to the building of Cathedral Clinic. 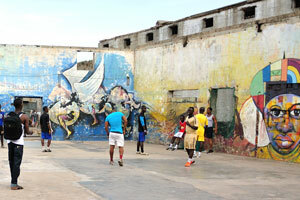 The popular playground is totally painted with graffiti. 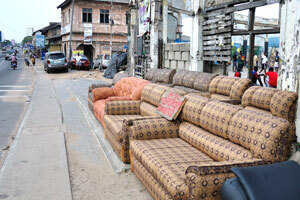 Various furniture from a furniture store are on the open air. 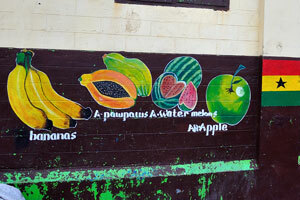 Sexual graffiti is on the wall. 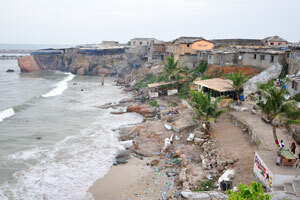 The Gulf of Guinea washes the shores of the city. 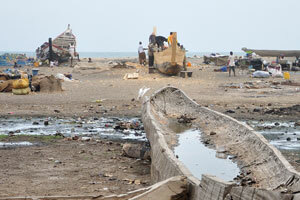 Coconut palm trees and the litter scattered on the shore of the Gulf of Guinea. 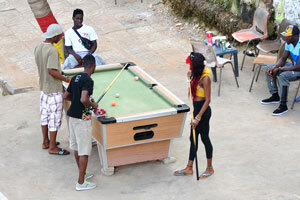 The girl in a yellow mini blouse is a real local super star. 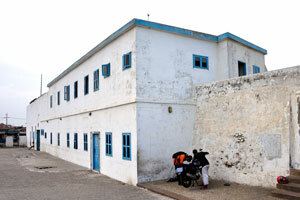 This ancient building stands here from the times of slavery. 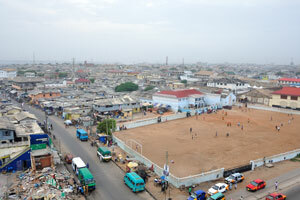 The funny district of “Phase 2” is located close to Jamestown. 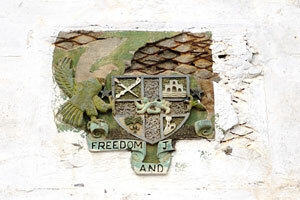 The inscription on the ancient memorial plate reads: “Freedom and Justice”. 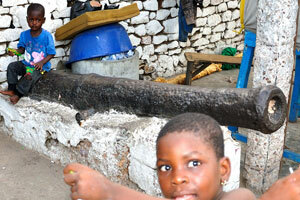 An ancient cannon is a remnant of colonial past. 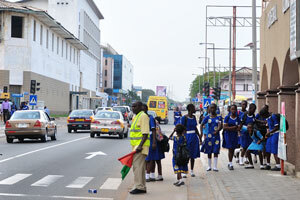 Pupils dressed in the school uniform are on the street. 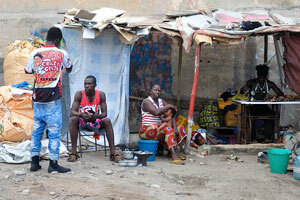 Man and woman are sitting on the bench on the street. 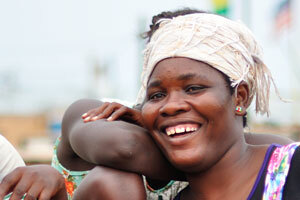 A beautiful Ghanaian girl is in the dress decorated with the huge purple circles. 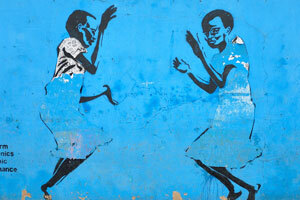 An unusual graffiti is subscribed as “Girls in uniform”. 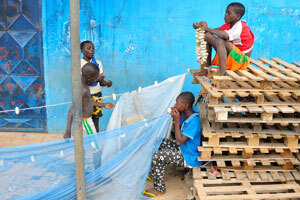 Young boys are repairing a fishing net. 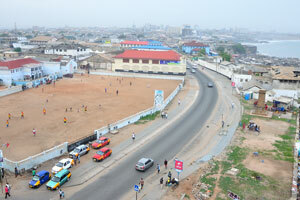 One of the beauties of the ancient city of Jamestown. A good-looking girl wears the unique dress. 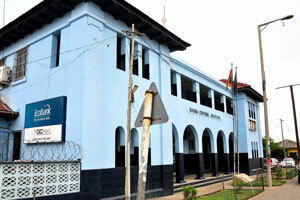 Ecobank, GCNet and Ghana Customs are found in the one building. 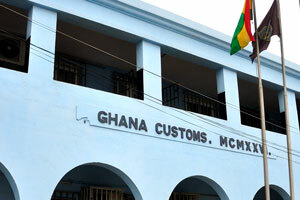 The blue building of Ghana Customs “MCMXXVI”. 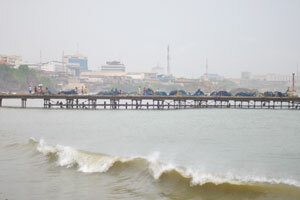 The Customs Excise and Preventive Service. 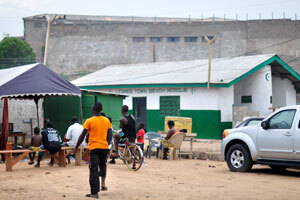 The Bible Society of Ghana. 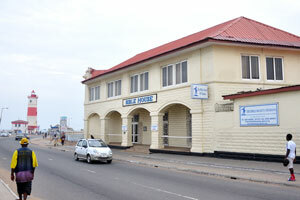 The Bible House is located close to the lighthouse. 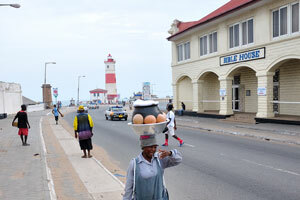 The lighthouse of Jamestown as seen from Cleland Rd. 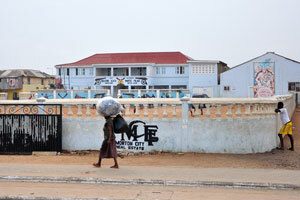 An advertisement of “Morton City Real Estates” is on the fence. 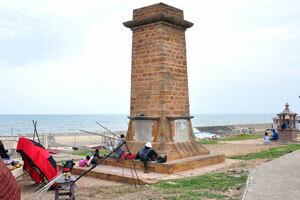 The brick tower is located close to the lighthouse. 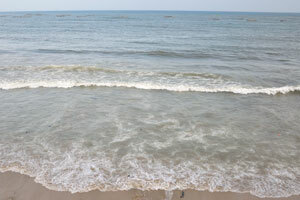 The Gulf of Guinea as seen from the lighthouse. 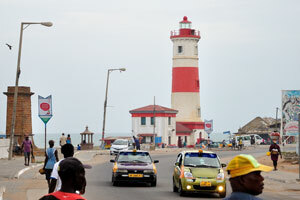 The lighthouse of Jamestown is 34 metres above sea level and has a visibility of 30 km. 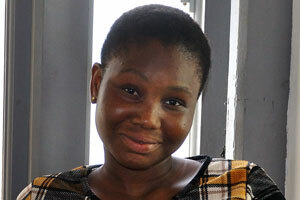 This portrait of the pretty african girl was taken inside the lighthouse. 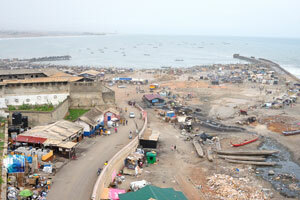 Slums of Jamestown as seen from the lighthouse. 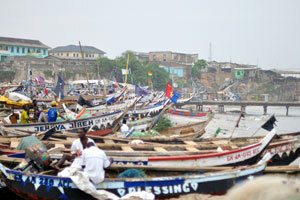 Jamestown is located directly east of the Korle Lagoon. 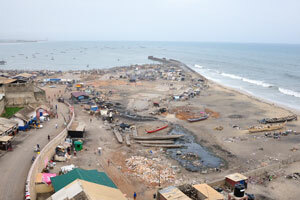 Jamestown emerged as a community around the 17th century British James Fort on the Gulf of Guinea coast. 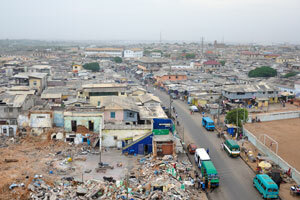 Jamestown is the oldest district in the city of Accra. 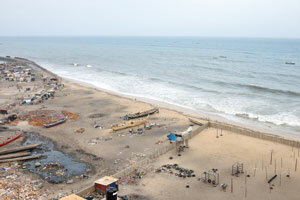 The Gulf of Guinea coast as seen from the lighthouse. 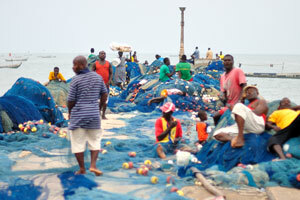 Today, Jamestown remains a fishing community inhabited primarily by the Ga. 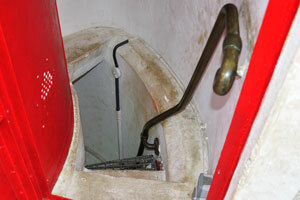 The inner stairway of the ancient lighthouse. 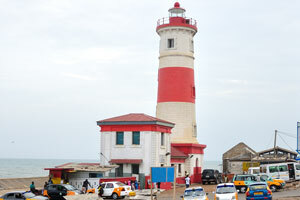 The original lighthouse, built by the British in 1871, was replaced in the 1930s by the current one. 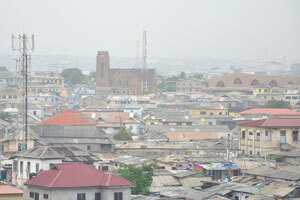 Jamestown became area of a dense mixture of commercial and residential use. 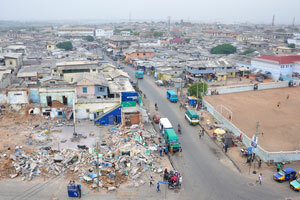 This district is a popular tourist destination for those seeking to see the remnants of Accra's colonial past. 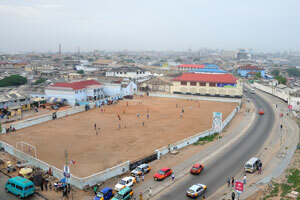 Jamestown is Ghana's oldest suburb. 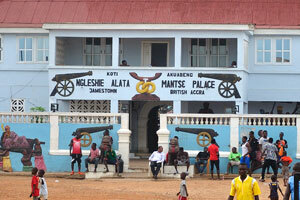 Jamestown boasts a fascinating history and vibrant local community. 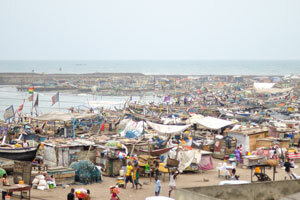 Jamestown is set on the coast of downtown Accra. 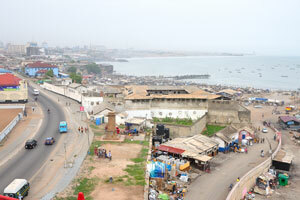 Jamestown as seen from the lighthouse. 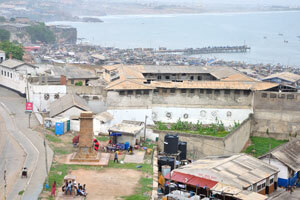 Jamestown consists of historical streets and key colonial sites. 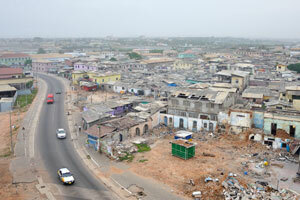 Partial view of Accra from lighthouse. 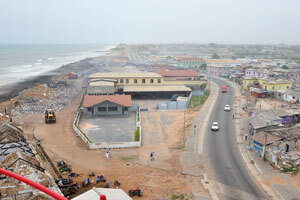 An incredible view on the city from the top of lighthouse. 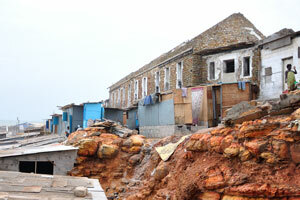 This ancient building was left for us from the slavery times. 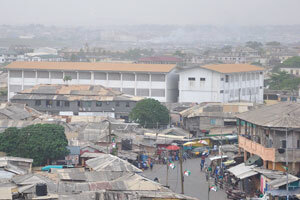 Roofs of the old city. 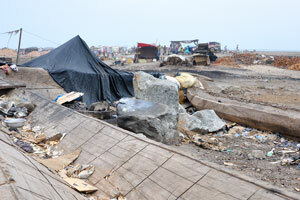 I am at the beginning of my walk in slums. 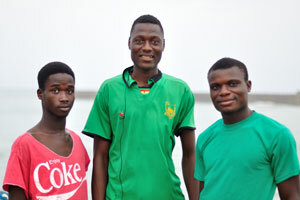 Boys came to welcome me warmly. One cute little boy has grabbed my leg. 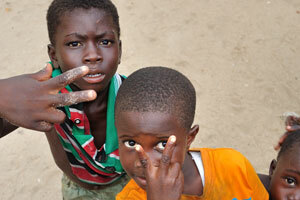 This gesture is very popular in Western Africa. 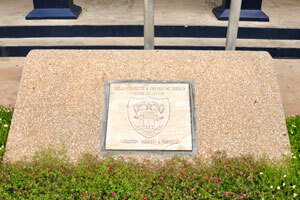 “Christ the King of Kings” preparatory school. 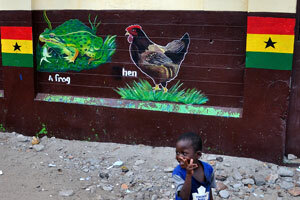 A frog and a hen are painted on the wall of school. 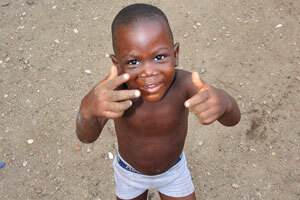 It is just a small funny boy. 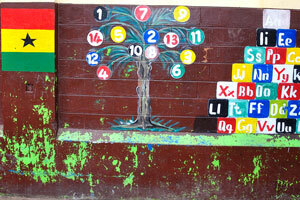 The Ghanaian flag is painted on the wall of school. 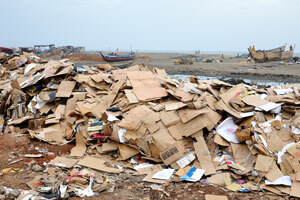 There are piles of cardboard in the slums. 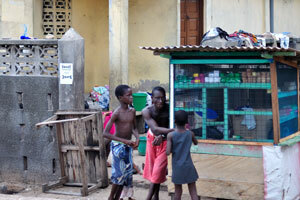 This an example of an ordinary house in the slums. 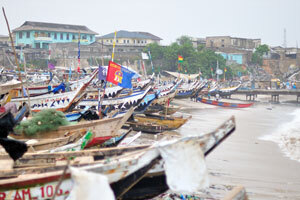 Boats are in the fishing village. 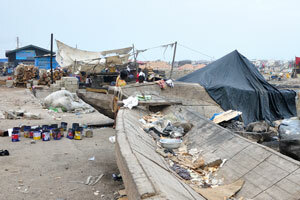 The first thing to know is that Jamestown is a slum. 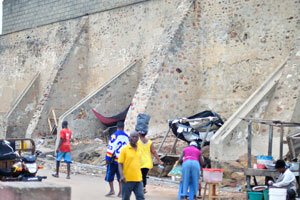 Nowadays, don't get me wrong, Jamestown is not dangerous. 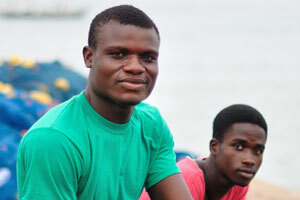 The most hassling you get in Jamestown is “tour guides” trying to give you tours. 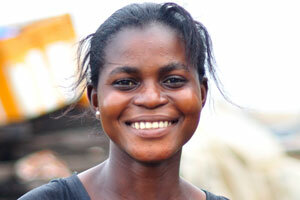 A good-looking girl lives in the slums. 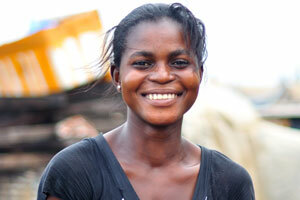 A beautiful girl which lives in the slums smiles to me. 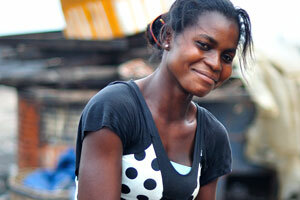 A beautiful Ghanaian girl lives in the slums. 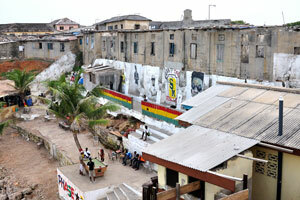 It is incredibly interesting to see people occupying the colonial properties. 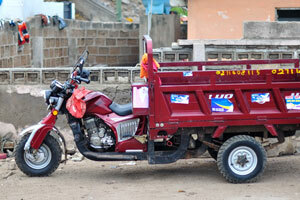 This model of motorcycle is made for transportation of goods. Young girl in a blue dress poses for photography in an original way. 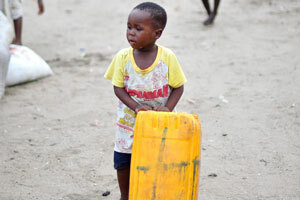 Young girl in a blue dress lives in the slums. 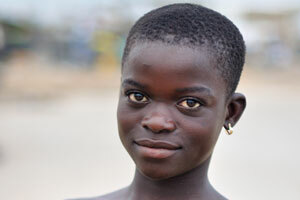 Young African girl from Ghana is smiling friendly. 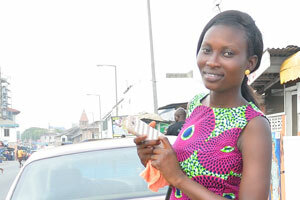 Young good-looking girl lives in the slums. 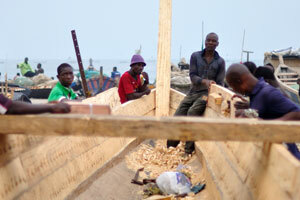 It is fascinating to watch the fishermen crafting the wooden boats. 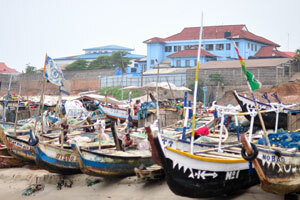 Colorful boats are in the fishing village. 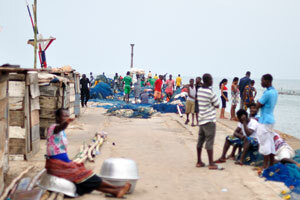 A fishing boat is in the Gulf of Guinea. 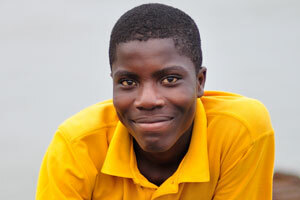 People in Jamestown do not speak much English, their first language is Ga, an indigenous language. 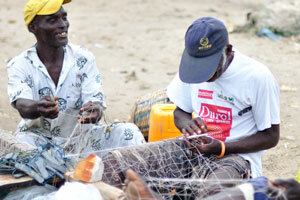 Three fishermen are weaving the fishing nets. 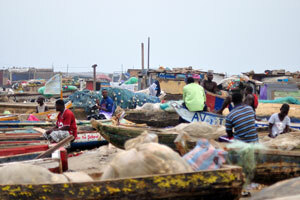 The fisherman's village is located on the shore of the Gulf of Guinea. 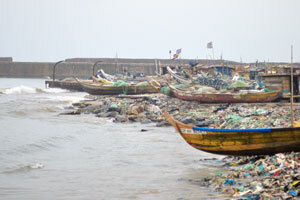 Garbage is on the shore of the Gulf of Guinea in the fisherman's village. 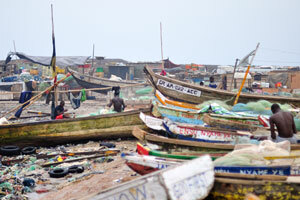 Boats are on the shore of the Gulf of Guinea in the fisherman's village. 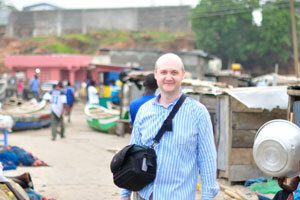 Walking through Jamestown, I was with a tour guide, who invited me to explore the fisherman's village. 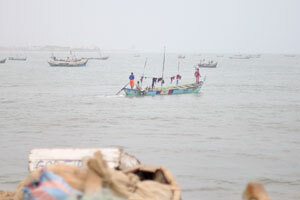 It is very interesting to see fishermen going out to sail. 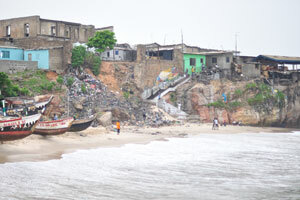 If Jamestown is poor, the fisherman's village on the bluffs below is even poorer. 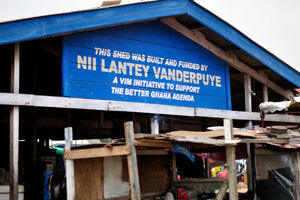 This shed was built and funded by Nii Lantey Vanderpuye. 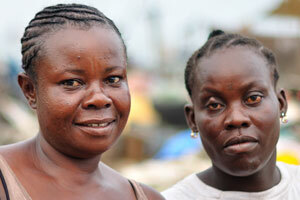 Two women are from the slums. 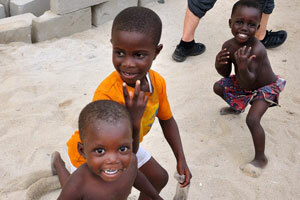 Because we were with a local guide, people were very welcoming and gracious. 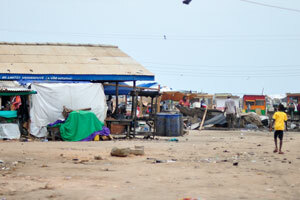 It's a slum with tightly-packed thatched houses, animals running around, and incredibly striking poverty. 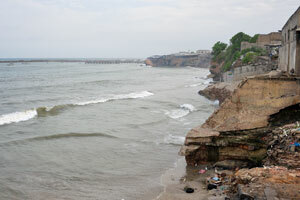 I have visited the fisherman's pier. 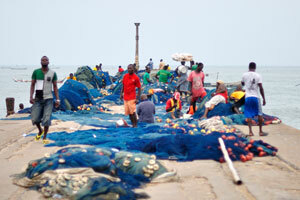 Fishermen are wandering along the pier. 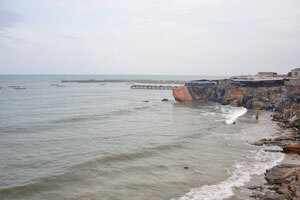 Remains from the colonial buildings. 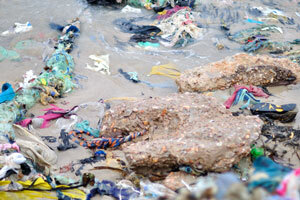 Huge heaps of fishing nets. 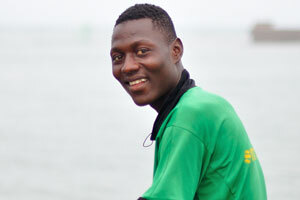 A fisherman has demonstrated a funny grimace. 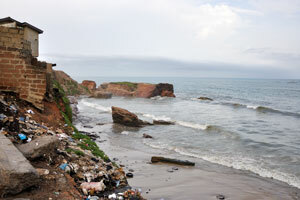 The coast of the Gulf of Guinea is covered by mist. 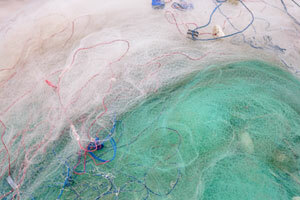 Huge piles of fishing nets. 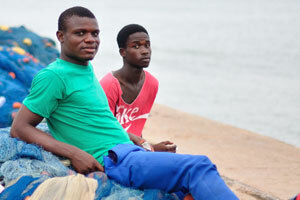 Two Ghanaian men are sitting on the pile of fishing nets. 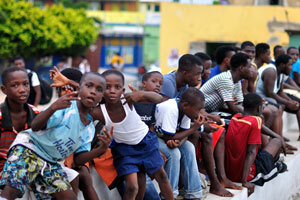 A Ghanaian man is smiling. 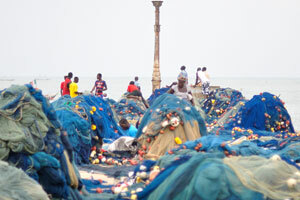 Young Ghanaian men are amidst the fishing nets. 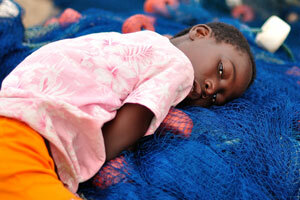 A Ghanaian child is lying on the fishing net. 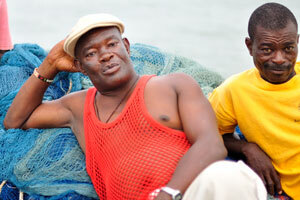 A fisherman has made a grimace, as if expecting something unpleasant. 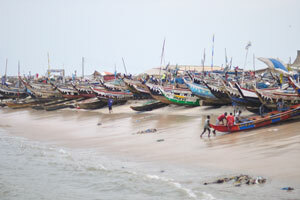 The shore is full of fishing boats. 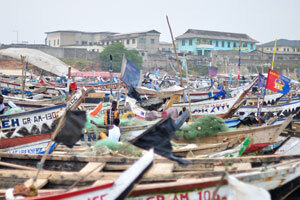 A rather thick mist rises over the fishing boats. Who can say these vessels aren't the pirate boats? 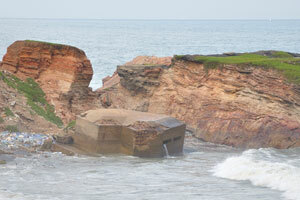 A rock is on the shore. 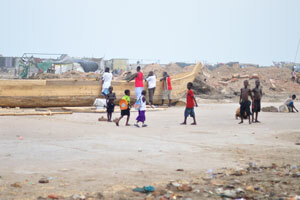 I like to wander in the slums. 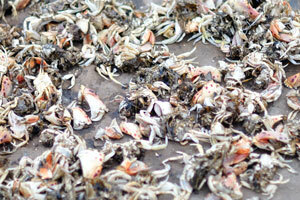 A fresh catch of small fish is in an aluminium basin. 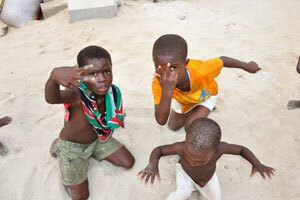 It is interesting to walk through the remains of colonial buildings while playing with local children. 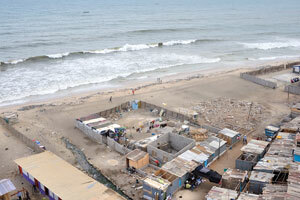 There is the restroom in the slums. 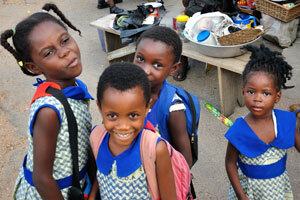 Three Ghanaian women are smiling. 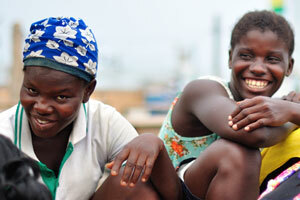 Three African women from the fishing village are smiling. 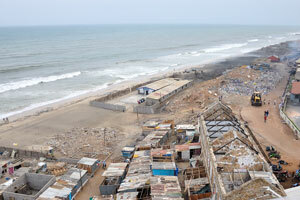 A bird's eye view down to the slums. 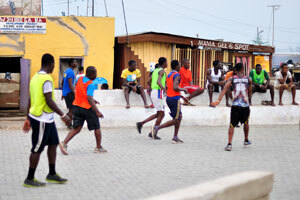 Men like to play soccer. 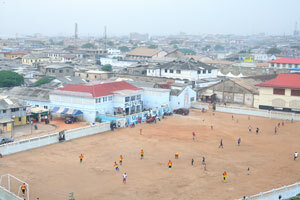 Men and children are on the soccer game after school. 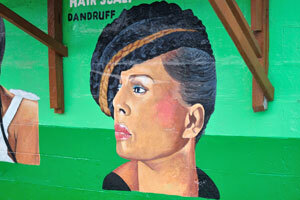 The painting of a woman's face is on the wall. 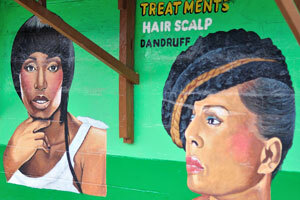 An inscription on the wall reads: “Treatments hair scalp dandruff”. 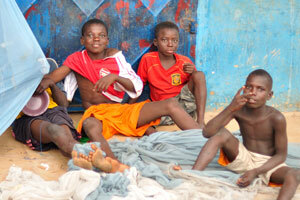 These boys are repairing fishing nets. 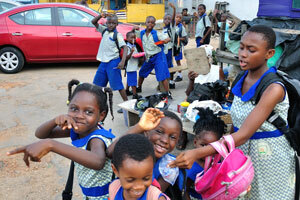 I didn't want to scare the schoolgirls, nevertheless, they panic with funny grimaces.